The statistic shows fossil fuel energy consumption in the United States between 1985 and 2018. 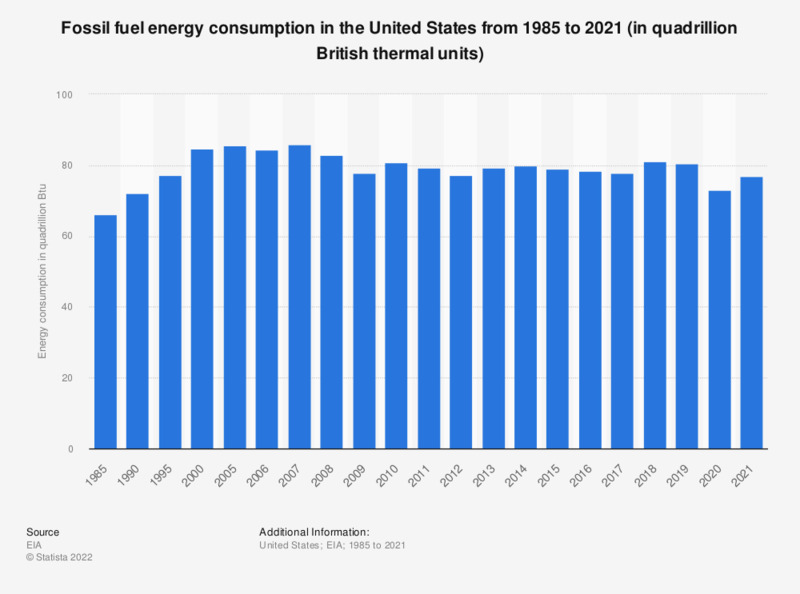 Here, the consumption of energy derived from fossil fuels came to approximately 81.2 quadrillion British thermal units in 2018. Fossil fuels are hydrocarbon-containing natural resources formed from the remains of dead plants or animals that have been subject to immense pressure from a buildup of layers over millions of years. There are three major forms of fossil fuels: coal, oil, and natural gas which were considered the world's primary energy source since the Industrial Revolution in the 18th century. The energy demand in the United States is largely covered by fossil fuels. In 2017, the U.S. generated approximately 4.02 trillion kilowatt hours of electricity. About 82% of the electricity generated was from fossil fuels and nuclear resources. Petroleum is one of the county’s main energy sources with more than 36 quadrillion British thermal units consumed in 2017. The liquid is predominantly used in the transportation sector. Despite its prominent use over the last few centuries, fossil fuels are finite resources and burning these fuels can harm the environment. Under the threat of climate change, the pollution caused by fossil fuels has put the industry under scrutiny. Burning any fossil fuels produces carbon dioxide, a greenhouse gas which contributes to global warming. The volume of global energy-related carbon dioxide emissions has steadily risen over the last few decades, from 15.54 gigatons in 1975 to 33.14 gigatons in 2018. There are several alternative resources that can supply clean energy, including water, biomass, wind, geothermal and solar energy. These renewable energy sources are slowly becoming more efficient and are argued to be competitive with fossil fuels as a means to cover global energy needs. Includes coal coke net imports.